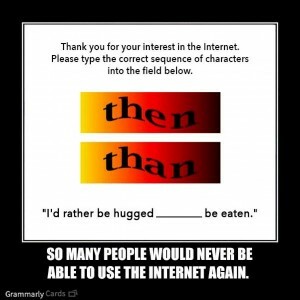 Surprisingly, I am not the only one on the Internet trying to set things straight in terms of American grammar and usage. And as I have written before, it’s terribly easy to mistake one word for another in English!. In terms of then and than, how can you remember which is which? Easy! Link “then” with “when.” They are both about time, and they rhyme. When will she arrive? Then she will arrive. This winter is colder than last year’s. When spring comes, then winter will end. And in the example above, the meaning really changes depending on which word you use. I’d rather be hugged, then eaten. I’d rather be hugged than eaten. One last tip: if you know you constantly goof up on a pair of words (your / you’re, for example), use your computer to help you see what you might be missing. Do a search for one of the words, and read what you’ve written carefully. Is the right word in that sentence? If not, it must be the other one.